CATI designs and manufactures shell and tube heat exchangers, deaerators and all other types of equipment that your industrial heating system requires. Continuous upgrading of the best software packages available on the market means that CATI offers its clients all the possible alternatives, highlighting the advantages and disadvantages of each, helping clients to make the right technical business choices. CATI is in a position to design and manufacture for any type of liquid and requirement, for thermal savings and energy use in cogeneration, power, hydrothermal and geothermal plants. Energy conservation and the maximising of energy recovery on a heating system is a system’s most crucial feature, and it is for this reason that CATI makes use of the fumes from ovens or motors or other production processes that produce saturate steam for the turbines or the utiliser or diathermic oil intended for cogeneration plants. The design and construction takes place under a quality control system in accordance with ISO9001 and ASME standards. CATI leads the way in Italy in the design and manufacture of exchangers for centralised district heating systems, and over the last few years has built exchangers for Italy’s major plants, including Polytechnic in Turin, two plants in Brescia, two plants in Bergamo, the Milan-Bicocca plant and the Milan Sesto San Giovanni plant. CATI can design and manufacture high-pressure equipment for installation in power plants for the production of electrical energy or the processing of natural gases and crude oil. Cati can handle the design and manufacture of API standard exchangers for the cooling of natural gas intended for compression units and oil coolers for the lubrication of the same compressors. Single pass pure countercurrent flow BEW type exchangers are primarily manufactured for these applications. One of the major threats to industrial plants is the residual oxygen contained in the feed water and condensate returns. CATI specialises in thermophysical deaerators, offering complete instrumentation and accessory packages for deaerators operating under pressure. For the design and manufacture of descending plate degassing towers is performed with our own patented water nebulisation system. This system provides the degasser with excellent output and reduces its size. 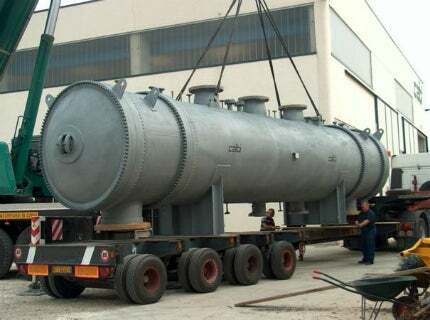 Usually, in addition to the degassing tower, a water collection tank is also supplied, sized according to the plant’s needs and the hold-up requirements envisaged by the process engineers. For the design and manufactures under pressure vessels made of any type of material, we have manufactured spherical devices in UNS 31803 Duplex, for pumping stations with a thickness of 90mm, designed to a pressure of 690 Barg, U-2 stamp marked. CATI designs and manufactures complete packages which are also supplied with electrical instrumentation and pneumatic wiring. CATI’s packages are supplied in transportable modules, along with any pipe work for interconnections.